An auction, eight stories and a tease in today’s Scroll. (1) Attention collectors! 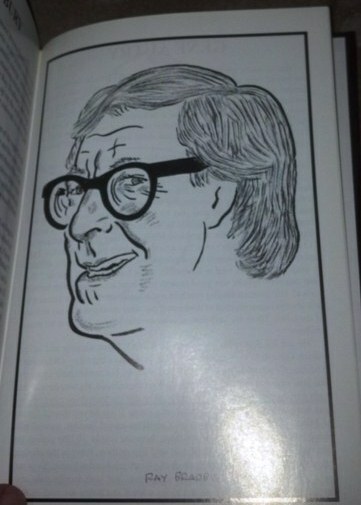 Somebody’s flipping Ray Bradbury’s original caricature from the Brown Derby Restaurant today on eBay. Jack Lane’s portrait once hung on the wall at the famed Hollywood & Vine tourist trap with hundreds more of the artist’s sketches of Hollywood stars. Ray Bradbury by Jack Lane. Once displayed at the Brown Derby. (2) The Center for Ray Bradbury Studies at Indiana University-Purdue University Indianapolis will hold three special events next month celebrate Ray Bradbury’s 95th birthday, which is on August 22. From Aug. 3 to 28, the center will present a free exhibit, “Miracles of Rare Device: Treasures of the Center for Ray Bradbury Studies,” in the Cultural Arts Gallery on the first floor of the IUPUI Campus Center…. The exhibit will feature art, artifacts, books and rare magazines from Bradbury’s own collection, gifted to the IU School of Liberal Arts at IUPUI in 2013 by the Bradbury Estate and by Donn Albright, Bradbury’s close friend and bibliographer. Two related public events will coincide with the exhibition’s run. On August 19, Jonathan R. Eller, Chancellor’s Professor of English and director of the Center for Ray Bradbury Studies will deliver the Second Annual Ray Bradbury Memorial Lecture in the Riley Meeting Room at Indianapolis Public Library’s Central Library. The lecture, “Ray Bradbury’s October Country,” reveals the timeless creativity and somewhat controversial publishing history of one of Bradbury’s most popular story collections on the 60th anniversary of its original publication. On August 27, the Center for Ray Bradbury Studies will host a reception followed by another Eller lecture, on the collection’s amazing journey from California to IUPUI and the importance of Bradbury’s legacy in the 21st century. Both the lecture and reception are free and open to the public. Each illustration is drawn on 11″ x 14″ Bristol board, and includes an appearance by the Bandersnatch somewhere in the picture. Prices are as listed, ranging from $450 to $750, although I am willing to entertain offers from people I like. First request, first choice. Message me to reserve your favorite and to arrange payment and shipping. 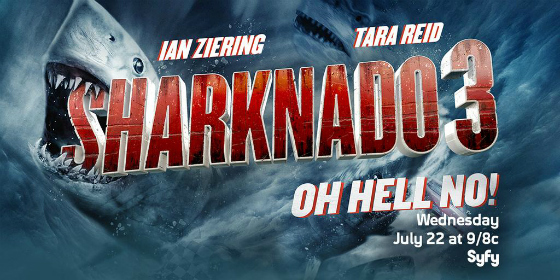 (4) Everybody knows Sharknado 3 airs today on SyFy. But it came as a surprise for me to read that George R.R. Martin plans to show the movie at his Jean Cocteau Theatre in August. Responses from — Kelly Robson, Jenny Goloboy, Galen Dara, Anne Leonard, Patrick Tomlinson, Julie Czerneda, Alyx Dellamonica, Django Wexler, Jesse Willis, Diana Pharoah Francis, Mikaela Lind, Rhonda Eudaly, Gillian Philip, Ardi Alspach, and Laura Anne Gilman. (6) Interested in stories read aloud? Open Culture has found another seam of the motherlode, 88 hours of free audio fiction original aired on Wisconsin public radio. Listen to enough episodes of Mind Webs, and you may get hooked on the voice and reading style of its host Michael Hanson, a fixture on Wisconsin public radio for something like forty years. Back in 2001, just after wrapping up his career in that sector, Hanson wrote in to the New York Times lamenting the state of public radio, especially its program directors turned into “sycophantic bean counters” and a “pronounced dumbing down of program content.” Mind Webs, which kept on going from the 70s through the 90s, came from a time before all that, and now its smart storytelling has come available for all of us to enjoy. The playlist above will let you stream all of the stories — roughly 88 hours worth — from start to finish. Or you can access the audio at Archive.org here. (7) Of course they knew those comic books were stolen! The Verge has the goods on the great Texas comic book heist. Whoever was after the Sub-Mariners and All Star Comics at the Heritage Auction wasn’t a collector. Their bids were too erratic, they didn’t know the market, and chances were, they weren’t terribly smart. It was also clear that they had a lot of money on their hands — too much money, maybe — and they were eager to spend it. Through months of interviews and hundreds of pages of public documents, The Verge reconstructed what they were seeing: a multi-million-dollar embezzlement scheme that would ensnare a crooked lawyer, a multinational corporation, and some of the most sought-out comics in the world…. $40,000 split between nine checks. The investigator said he was going through a nasty divorce, and was worried his ex-wife might raise trouble over any checks for more than $10,000. But what about that foxing? When the buyers took their comics home, they noticed something strange: the All Star #3 that had sold in February had the same imperfections. In fact, it was the same book. But that book was slabbed — it had a barcode and provenance, sold to a private buyer who wouldn’t have deslabbed it without a reason. Had they bought stolen property? It was worse. They had bought stolen evidence. The book had come direct from Chiofalo’s storage unit, smuggled out under the nose of the Harris County DA — and according to prosecutors, Blevins and Deutsch worked together to smuggle them out. More than $150,000 in comics had disappeared from the storage unit, and Blevins had spent the summer selling them at comics conventions across the country. The books were deslabbed to throw investigators off the trail, but even without the barcode, the cover gave it away. Collectors search for flawless comics, but it’s the imperfections that give them an identity, and this imperfection placed Blevins at the scene of a crime. (8) Did Tolkien visit the Bouzincourt caves while on Army service during the Battle of the Somme? In 1916, a 24-year-old British soldier named J.R.R. Tolkien went off to fight in World War I. He was stationed near the village of Bouzincourt, took part in the nearby Battle of the Somme and writes about the area in his diaries. Tolkien scholar John Garth isn’t so sure. “On the Somme, he certainly spent time in deep trench dugouts, and he would have been aware of the subterranean world of the army tunnelers — all of which would, I believe, have given his descriptions of Moria and other Middle-earth underworlds some of their vitality,” Garth, the author of “Tolkien and the Great War,” wrote in an email…. “The Dead marshes and the approaches to the Morannon owe something to Northern France after the Battle of the Somme,” he wrote in a letter, according to a story on the Green Books portion of TheOneRing.net. (9) “Stick a fork in the pup’s Tor boycott because their hushpuppy is done” says Jason Sanford. Earlier this month I tracked the sales of a sample of ten book titles published by Tor Books. My desire was to see if the puppies’ boycott of Tor was having any effect on the publisher’s sales. After examining two additional weeks of sales data it appears my initial analysis was correct. This new data shows that for the five weeks prior to the boycott starting on June 19, the weekly sales average for these Tor titles was 1652 books sold per week. For those same Tor titles, their weekly average sales for the last four weeks of the boycott has been 1679 books sold per week. So on average, Tor’s sales for these titles are up slightly since the boycott started. (10) Vox Day’s “Hugo Recommendations: Best Professional Artist” post is up. Don’t try and kid me, you know you want to read it. This entry was posted in Pixel Scroll and tagged auction, audiobooks, Center for Ray Bradbury Studies at Indiana University, comic books, Diana Pavlac Glyer, George R. R. Martin, Inklings, J.R.R. Tolkien, James A. Owen, Jason Sanford, Jonathan R. Eller, Ray Bradbury, Sharknado, Vox Day by Mike Glyer. Bookmark the permalink. Yes. 1. The official definition, a few sentences above the poorly sourced “often define” bit you chose to bold. (The link is to a single paper of no particular provenance.) 2. What Kurt and I (and maybe others) have already explained about the usage of the term in this thread. YA is books for teens. Books-for-teens is in no way a particularly American concept. Ok, so YA is book for teens and thats it. Okay, I can live with that. Still don’t want to separate them out from the best books, but thats not done anymore so thats okay too. @Kurt: I would agree with you that The Book of Wonder was the right choice, except that the ground rules have been revised to exclude wide-ranging collections. Perhaps an exception could be made in this one case. Trying to finalize the lists. I’ll likely start with the 90’s, and may post it when the next Pixel Scroll goes up. Given that Taran Wanderer is probably not even YA but a Middle Grades book, it seems the easiest thing to swap out for Interview with a Vampire. While I’m pretty happy with the names on this list, there’s a number where I’m not 100% certain I’m putting up their best work. For Dunsany, I could probably be convinced of “The Gods of Pegana” over “The King of Elfland’s Daughter” (“The Book of Wonder” doesn’t qualify under the rules.) Thoughts on their relative merit? For the Poe, the Lovecraft, and the Cabell I might be argued into something else. The Howard and the Leiber I think contain some of their best work, but if anyone thinks otherwise let me know … Some have suggested some of MacDonald’s stuff aimed at younger audiences now that YA is back on the table, but it’d be hard for me to leave off Phantastes. If we are including comics then Bone! Perhaps a separate playdown bracket for comics? Esp. as the variety of styles makes it extra obvious in places how much the artist influences the reading. Not just the reading, but the writing, too, and at times the basic story. They’re collaborations; the script is written to suit the artist, often after consultation and conversation with the artist on what the story should be. You’re apparently putting a lot of weight on Wikipedia. While various authors may aim their work at varying spots within the range, or even overlapping the bounds of the range, I’ve never once encountered a YA section in the US that was for 16-up. I would agree with you that The Book of Wonder was the right choice, except that the ground rules have been revised to exclude wide-ranging collections. If the ground rules have been revised so as to leave out Dunsany’s best, might as well leave him out entirely. But then, I don’t think of the stories in BOOK OF WONDER as “wide-ranging.” They don’t overtly take place in the same fictional reality, but for the most part, they could. And they share a tone and narrative approach that I think links them. But it ain’t my quiz. If the focus is on “best novel-or-book-of-overtly-linked-stories,” that seems like an oddly-narrow choice. But I’m not the one making the choice, so it isn’t up to me. Do it however it works for you. It’s your thing. If I wanted it done the way I’d do it, I should put in the work. And I’m not going to do that, so the way I’d do it is irrelevant. I think we should find out how Roy Blank thinks it should be done and then Kyra does all the work that way. First step, Kyra should run the bracket from North Korea. They have at least one SF book there. I left Ex-Heroes in my hotel room a few years ago. You have already won several internets, that gives you carte-blanche to displease whoever you like IMHO. Also it isn’t like this the only time ever that anybody could run a bracket here – so go with what you think is best. Anyone who made a list would displease someone because the list wasn’t identical to what they wanted. Thats just the way it is. I’ll do the same as for the SF list. See what works win the first round or two, then check what books I haven’t read and place them in my shopping basket. If it were run for North Korea, then surely it would be a contest for second place as the winner is already known. Hmmm should I vote for Kim Jog-un or Kim Jong-il? Decisions, decisions. I prefer the classics of Kim Il-sung. His War of the Worlds, 20,000 Leagues Under the Sea, The Hobbit, and Starship Troopers still sell quite briskly today. It is amazing how he found the time to write those between finishing the Iliad and Remembrance of Things Past. No one except our great and glorious Leader, of whom all sing praises, would have believed that this country was being watched keenly and closely by intelligences greater than any man’s except the Leader’s, accolades be heaped upon his name; that as men busied themselves about their various concerns with tireless dedication for the good of the State they were scrutinised and studied, perhaps almost as narrowly as our top-rank scientists with their top of the line equipment might scrutinise the transient creatures that swarm and multiply in a drop of the unclean water all are forced to drink in less enlightened countries. Do you have a Patreon account? I am looking forward to the final list, by the way. Kyra, have a shiny new North Korean Internet, as censored sanitized by our Glorious Leader…. I don’t even want to think about how crowded with Internets it is at Kyra’s house. Kyra: Silverlock by John Myers Myers in the 50s and before? Don’t know if you are still checking this thread, may put the suggestion in the current Pixel Scroll as well.